You've grilled Korean BBQ on your table, mixed heaps of spicy chili paste into your bibimbab that came in a stone pot, cracked an egg into a piping stew of soondoobu (soft tofu) and long for something new and unconventional. Head to Shin Jung in Koreatown for melt-in-your-mouth braised cod and luscious raw crab. This restaurant is in a nondescript mini-mall on Sixth and Kenmore Streets that offers other standard fare such as kimchi jjigae (stew) and mandukook (dumpling soup). The decor, as in many Korean restaurants, is nothing to write home about. 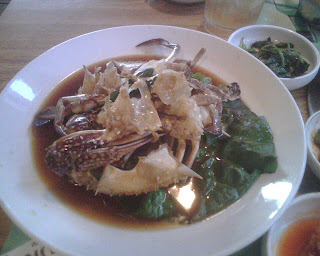 The things to get are eundaegu jorim (braised cod) and kanjang gejang, raw crab marinated in garlic and soy sauce. 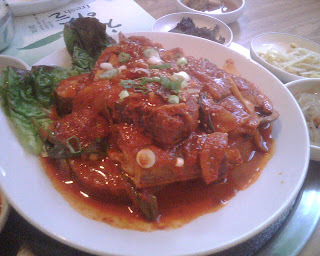 The braised cod looks massive and intimidating at first, but as you bite into that moist, soft cod meat that is perfectly marinated in a blend of garlic, chili paste with a hint of sweetness, you can't stop. Before you know it, all that is left are the super soft radishes that have soaked up deep red juices of the marinade and have a very subtle sweet taste. Soft but not mushy, the radishes complement the cod's meaty texture tremendously well. For those who can't handle too much heat: not to worry. The marinade looks spicier than it is, and that's a good thing because you don't want it to be overpowered by spice. That's not what this is about. 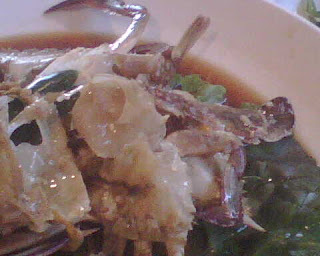 The crab was disassembled and plated in a user-friendly manner for our benefit. The crab that had been marinating for days was salty enough but not overly so, and I could taste the garlic infused in it, which makes for a great match with the almost gooey texture of the raw crab. It's tricky to extract the meat (and you thought it was hard eating a steamed crab), especially as there are no special utensils or cute paper aprons offered. Suffice it to say that two of us totalled these two hefty dishes. 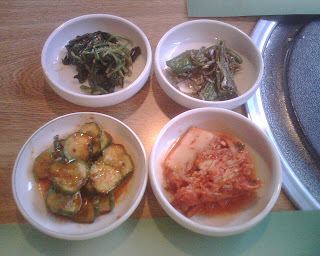 I was pretty impressed with two of the banchan (side dishes) as well. Restaurants usually pour MSG into their banchan and don't really invest too much in getting quality ingredients, but Shin Jung's banchan stood out. Its spinach namul was seasoned with fermented Korean soy bean paste (not the milder miso) unlike the usual garlic and salt variety. The cucumbers in vinegar and red pepper flakes were also crunchy and seasoned just right. 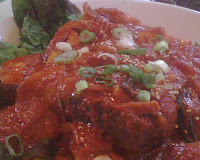 Other side dishes were ok to below average. 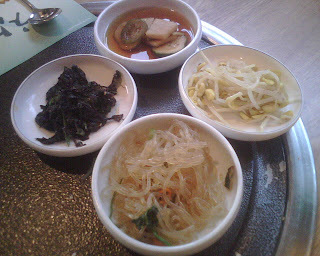 The japchae was unremarkable (99% glass noodles, 1% other), the seaweed was too dry and pan-fried baby anchovies were soggy (must hear the crunch when biting into it). The two main dishes above don't come cheap at about $22 a pop, but they are well worth it and could probably feed more than two (we were hungry). Show me the Shin Jung! Show me the Shin Jung! This blogger's significant other never get's taken anywhere good. that's because the s.o. always has a soccer game to go to, or heads straight to you-know-where on hoover and olympic.